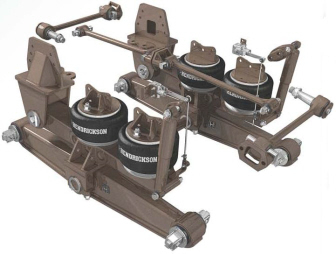 The Hendrickson AR2 gives you a better ride empty or loaded and improved suspension performance by converting your RT/RTE suspension into a highly engineered and lighter weight walking beam air ride. Improved ride reduces road shock and vibration to the vehicle for longer service life and fewer repairs to the cab, chassis and body equipment. Air springs provide long service life and easy replacement. Bar pin rubber end bushing extends service life and provides alignment capability. Rubber bushings enhance articulation and help reduce load on mating components. AR2 provides the versatility for demanding job sites or off road conditions. When loaded, AR2 delivers up to 14 inches of diagonal wheel articulation to keep load on all drive wheels. Kit includes two new trailing arm and saddle assemblies, shock absorbers, heavy duty transverse torque rods, height control valves, four air springs, frame hangers, detailed installation instructions and a parts list. 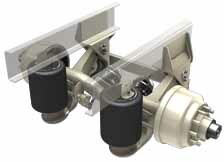 The Hutch 9700 Series remains the leader in a distinguished line of trailer suspension systems. 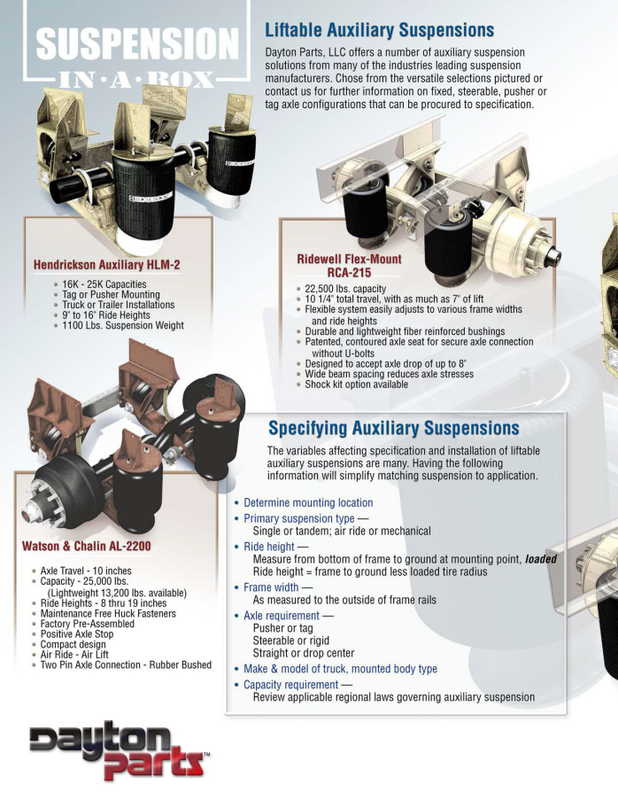 Hutch Suspension incorporate innovative thinking that results in a durable and reliable system that not only extends service life, reduces downtime and protects you cargo, but also provides a smooth and comfortable ride. 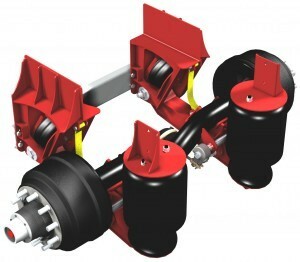 The 9700 Series an be assembled in single, tandem or multi-axle configurations. In addition, mounting heights from 6" to 20+" are easily achieved. Mounting height (Mtg/ht) is the distance from the center line of the axle to the top of the spring hangers. A wide variety of springs offer suspension capacities from 22,400 up to 25,000 lbs/axle. Hangers come in a wide variety of styles designed to fit numerous mounting requirements.